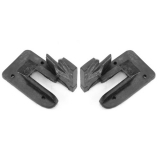 This is a pair of correct rubber Chevelle quarter glass seals which attach to the quarter glass chrome moldings to seal the door glass to the quarter glass. These seals are made for the purist with steel cores just as original. This part was exactly what it said it was...super easy to install and seals up great! I will definitely be ordering from these guys again! This quarter glass seal was a breeze to install. The part fit right into place with ease. I would recommend using a little lubricant on seal to help with install. This was a perfect fit for my '70 Chevelle and it seals properly with both windows closed.